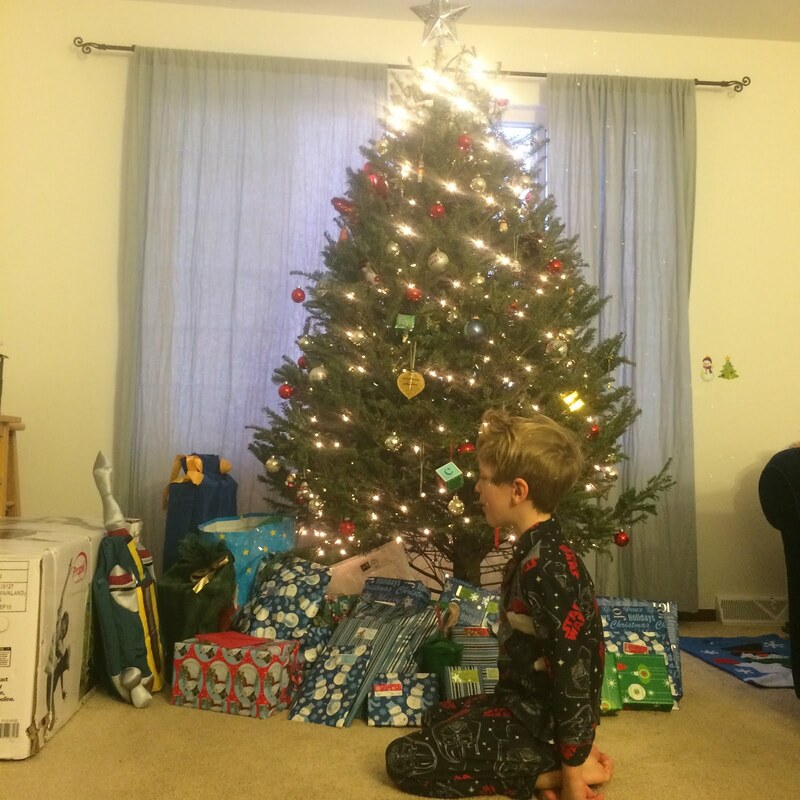 Christmas 2015 was the first time we ever had Christmas on our own, without traveling (often to numerous locations) to be with family. It was the first time Will ever had Christmas with just us, his mom and dad, in our own house. It was wonderful, but lonely too. We had decided to do this because we'd seen all our families in both August and late October. And if we didn't go back "home" for Christmas, we could go to Arizona at the end of December and run Across The Years. Which seemed like the thing to do. Will was so excited about Christmas. He spent the entire month of December giddy with anticipation. On the big day, he managed to sleep until about 7 o'clock before woke me by zipping into our room and pressing his face against mine, asking to eat breakfast and open presents. He got way too many presents. 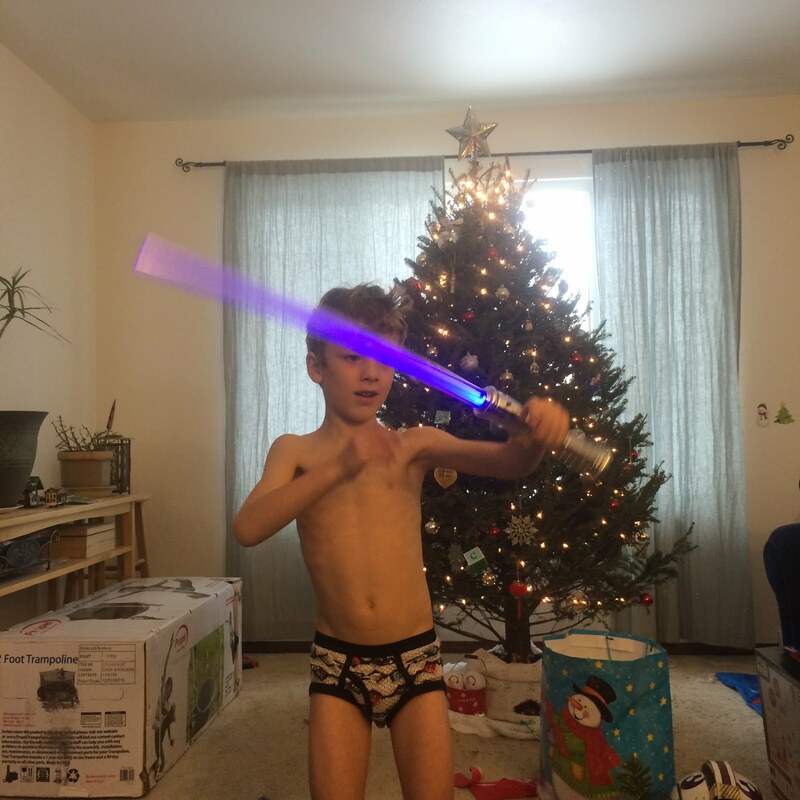 He stripped down to his underpants when he opened the light saber. I have no idea why. 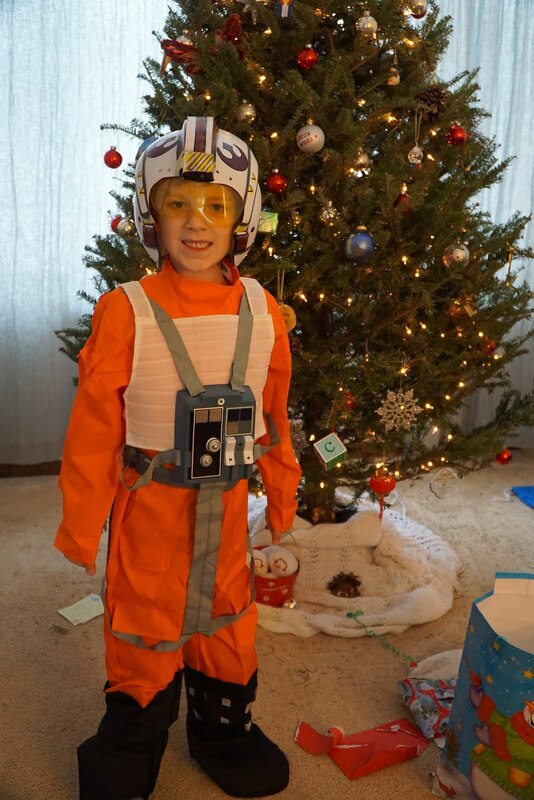 The X-Wing suit was just what he always wanted. 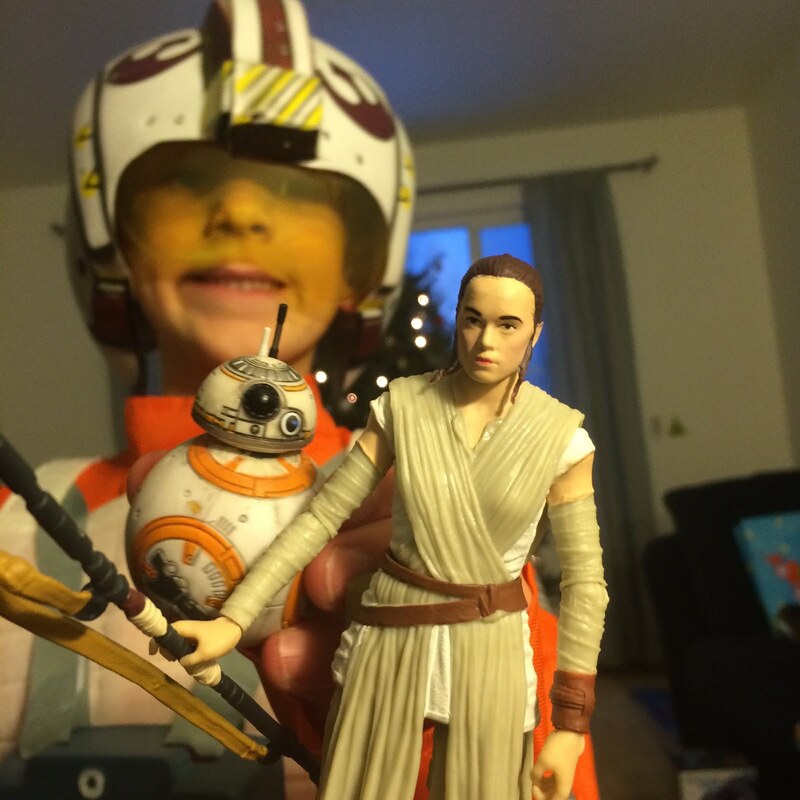 Will gave me a Rey and BB-8 doll, because he thought I needed something to play with. 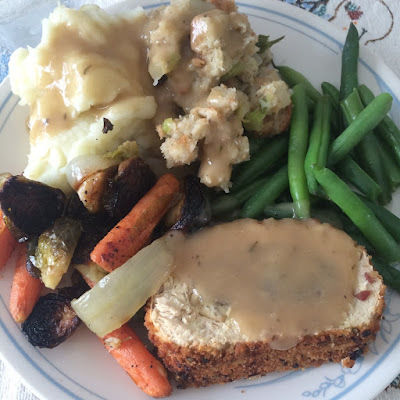 I wanted to keep things simple for Christmas dinner, so I had bought a Gardein brand "holiday roast." I bought an extra package of stuffing to go along with it, and I roasted some carrots, Brussel's sprouts, and onions. 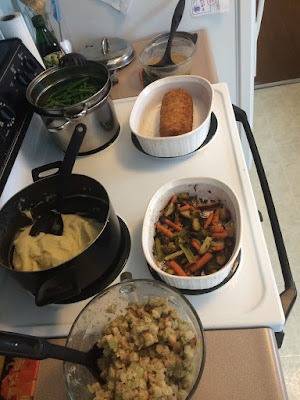 Rob and Will had requested mashed potatoes, so I made those too, and because I thought we needed something else green, I decided to add green beans to the mix. All of it was really simple and took me less than 2 hours to make, as light saber battles raged around me. I was very pleased at how it all turned out, and really, how very easy it was. Somebody remind me next year to just do this again and not try something fancy. Oh, and the best part too, was what I created for dessert, which Rob named Peppermint Winter Cake. It is really just my usual chocolate cake (the one I make for all celebrations: birthdays, graduations, weddings, etc), except instead of vanilla, I added peppermint extract, and I substituted some of the sugar for crushed candy canes. I also melted chocolate chips on top for frosting and then sprinkled the remaining crushed candy canes on top of that. It was good, very good. 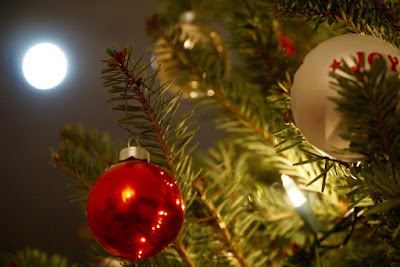 However, once Christmas was out of the way, there was nothing to keep me from succumbing completely to taper madness and full-on panicking about Across The Years. 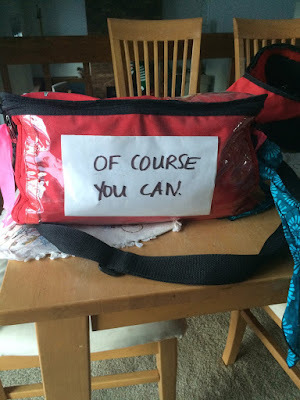 I'd been wandering around the house for days, making lists of things and doing some light packing, but I was nowhere near ready. By the end of the day, I was a nervous wreck. In my mind, I knew what kind of abysmally pathetic training I'd had and that attempting Across The Years under these conditions was just about the stupidest thing I could do. But in my heart I thought, of course you can. And with that, it was time to go. A simple Christmas for you, Rob and Will at your own house in the mountains... i like it --- the picture of the moon and the decorated tree is awesome, the light sabers and the very attractive Christmas dinner made it very special -- but the most special of all is that precious little boy and his 'at home' Christmas with his 'too many presents' -- As he grows up and has many Christmases of many kinds in many places, it will probably be his most favorite Christmas of all. AND, of course you did!!! We all knew you would!!! Keep writing!! Just one more thing ... as i read about the Winter Peppermint Cake, i was waiting for just a 'dash' of lemon to appear ... like in the sugar cookies!! But i think the Peppermint and chocolate is a perfect combination!! !